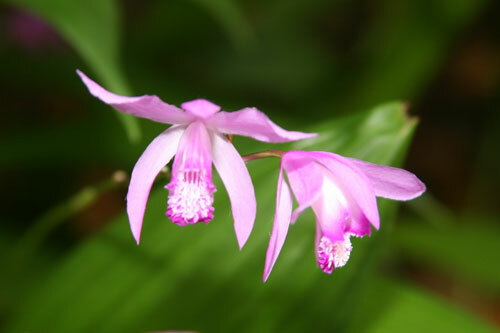 The 9 species of Bletilla, of which the most popular is Bletilla striata, the Chinese Ground Orchid, are terrestrial orchids that are hardy in places where the ground doesn't freeze. With sufficient mulching, these can be cold hardy orchids down to USDA zones 5-6. They shouldn't be confused with the Ground Orchid, Spathoglottis plicata. They have thin, pleated leaves that resemble a small palm tree, and they produce about 5 flowers per stem. The Chinese Ground Orchid is a purple orchid; white orchids are also common in this genus. The flowers superficially look a lot like a Cattleya, but with detailed patterns of spots and stripes on the lip. (They aren't related to Cattleya; they are actually more closely related to Calanthe.) Clumps of them will steadily grow from year to year, until after a few years they put on a very good show with many flowers at a time. Plant them in a soil mix appropriate for terrestrial orchids. You can grow them in pots too, if you live in an area that's too cold in the winter. Try to plant Chinese Ground Orchids in a spot where they get morning sun but are protected from the noonday and afternoon sun. Lighting should be roughly similar to what you'd use for a Cattleya orchid, about 3,000 footcandles. They can dry out a bit without trouble. Try to water just as they reach dryness. Water before they've dried out, and you risk overwatering. Wait too long after they've dried out and they'll wilt, especially if it's a hot day! Intermediate temperatures are best; go for 70-80°F (21-26C) during the day. Humidity isn't very important for these orchids. 50% or higher is best.